V3 Internet Security is a comprehensive security program that not only scans for and repairs viruses and spyware but also protects your computer and private data, by preventing malicious code and hackers from entering your system through the Internet and by blocking private data leaks. AhnLab V3 Internet Security Platinum will enable you to secure your system agains viruses, hacking, spyware, phishing and spam. As the Internet develops and the number of the users increases, malicious codes, such as viruses and worms, that harm computers are spreading more quickly and widely through the Internet. In order to keep your computer from being infected by malicious code such as viruses and worms, it is important to check all data coming in through the Internet, as well as existing files on your computer, to detect and block malicious code. V3 Internet Security uses AhnLab's proven V3 anti-virus technology to protect your computer by detecting, repairing, and blocking various types of malicious code that infect through the Internet. As more and more people use the Internet for e-commerce, such as Internet shopping and on-line banking, and the importance of personal data required for e-commerce increases, the number of incidents of private data being disclosed while the user is not aware of this disclosure, also increases. Private data can be disclosed by a spyware program installed when use is not aware of this, by a phishing site that deceives the user, or by a hacker intrusion. V3 Internet Security not only detects, removes, and blocks spyware but also keeps important personal data from being disclosed by phishing sites, e-mail, messenger programs and/or websites. It also blocks hacker intrusions. You can use V3 Internet Security to protect your computer from malicious code and keep your private data safe from spyware and hackers. · Virus scan uses an anti-virus program to detect and repair any infected files on your computer, and to prevent new viruses from trying to infect it. · A Spyware Scan tracks down spyware programs previously installed on your computer and blocks new spyware from being installed. · The Personal Firewall blocks unauthorized users from accessing your computer or shared folders through the Internet and keeps malicious codes, such as worms and Trojan horses, from entering your system. · Network Intrusion Prevention detects and blocks attacks from malicious code such as worms and Trojan horses in real-time. · Privacy control prevents the private data you configure as protected from being sent to unauthorized websites or other users through websites, e-mail, or messenger. · If you try to access a blocked website, your access is blocked and the Website Blocked Page appears. You can prevent your children from accessing harmful websites, such as adult content or gambling sites, by blocking those sites. · Real-time virus scan continually checks all incoming and outgoing e-mails, to prevent viruses and worms from sending infected mass e-mails to other users registered in your e-mail address list. · According to the anti-spam rules set by the user, blocks spam entering via e-mail programs such as Microsoft Outlook Express. You cannot download any crack or serial number for AhnLab V3 Internet Security 2007 Platinum on this page. Every software that you are able to download on our site is legal. There is no crack, serial number, hack or activation key for AhnLab V3 Internet Security 2007 Platinum present here. Our collection also doesn't contain any keygens, because keygen programs are being used in illegal ways which we do not support. All software that you can find here is freely downloadable and legal. AhnLab V3 Internet Security 2007 Platinum installation package is prepared to be downloaded from our fast download servers. It is checked for possible viruses and is proven to be 100% clean and safe. Various leading antiviruses have been used to test AhnLab V3 Internet Security 2007 Platinum, if it contains any viruses. No infections have been found and downloading AhnLab V3 Internet Security 2007 Platinum is completelly problem free because of that reason. Our experts on malware detection tested AhnLab V3 Internet Security 2007 Platinum with various spyware and malware detection programs, including fyxm.net custom malware and spyware detection, and absolutelly no malware or spyware was found in AhnLab V3 Internet Security 2007 Platinum. All software that you can find on our servers, including AhnLab V3 Internet Security 2007 Platinum, is either freeware, shareware or open-source, some of the software packages are demo, trial or patch versions and if possible (public domain licence), we also host official full versions of software. Because we want to be one of the fastest download sites on the web, we host all the software including AhnLab V3 Internet Security 2007 Platinum on our servers. You cannot find here any torrents or download links that would lead you to dangerous sites. 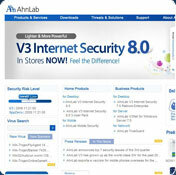 Rate AhnLab V3 Internet Security 2007 Platinum 7.6.2.1 Build 763!